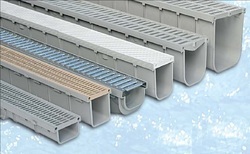 SAB drain channel are in PP ( Polypropylene), a material that has good mechanical & heat resistance. Polypropylene resists to chemical and atmospheric agent, acid, salts and alkali, oil & petrol. These features make SAB drain the ideal system for roads and Highways, car parks, petrol stations, cycle-lanes, pedestrian precincts, industrial conglomeration, airports, as well as for more particular installation such as chemical plants, slaughterhouse or waste dumps. PP feature make the channel surface extremely smooth, the little roughness of the surface allows the water to flow easier and avoid the accumulation of deposits by facilitating the cleaning. SAB drain channels are made in compliance with EN1433 standard, which define the terminology, classification and overall requirements, as well as the evaluation of compliancy of drainage and water draining. All SAB drain channels come equipped with a male / female embedding system that allows to connect the both ending in an easy and safe way on site. For safer water tightness a sealing agent is recommended. All SAB drain Channels allow the lateral 90 degree connection between two channels, this connection allows to easily carry 90 degree tees and crosses without having to acquire expensive special fittings. All SAB drainage Channels comes equipped with a series of lateral and lower preset connections for pipes, each preset connection has an opening that can easily cut on site. SAB drain channel is available in all suitable load classes like A15 to F900. 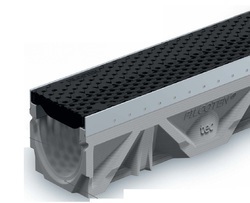 Available in 100 mm to 400mm Width & 50 mm to 300mm Height with various load class application. Application area : Terrace Drain , Balcony Drain , Podium Drain, Parking Drain , Lawn Drain , Sports Ground Drain.